AMAZON TOP 10 THRILLER BEST SELLER! What would happen if Dan Brown had collaborated with sci-fi writer Michael Crichton? They might have given birth to a novel about a technological doomsday filled with echoes of an ancient prophecy. In Satan’s Road, a group of prominent University researchers uncover a plan to destroy civilization over a twenty-four hour period using the Internet. Analyzing the Book of Revelations with a new super-computer reveals the end is coming soon and behind the cyber Apocalypse is an end-of-days cult called the Soldiers of Patmos, holed up in an armed compound only miles from Washington DC. Untouchable. Armed to the teeth. Finger on the button. When the researchers start to die and disappear, the last surviving professor, Kam O’Brien, decides he is the last hope. He must find his way into the cult to rescue his kidnapped wife and end the threat. The book-worm becomes reluctant avenger. Infamous Washington Homicide detective, Gregory Hyde, joins forces with his old flame, Jann Stone of the FBI, to confront the messianic leader of the cult and prevent a military confrontation that could be hundreds of times more bloody than the Waco Siege. 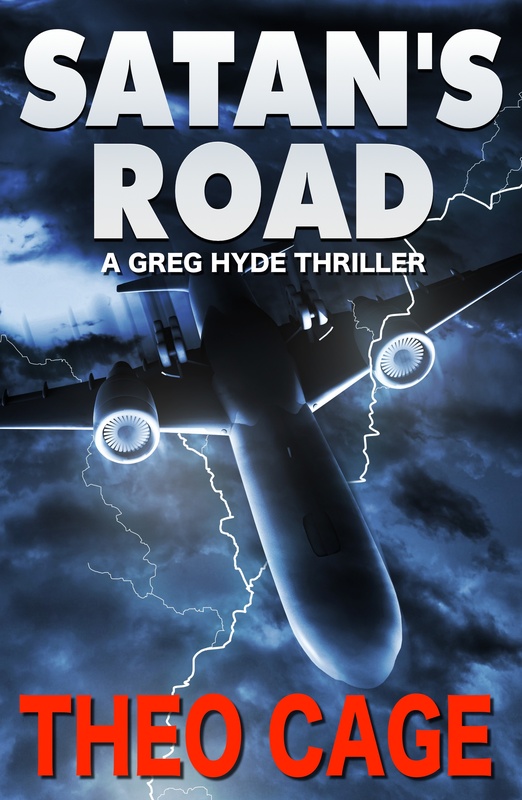 Satan’s Road climaxes when the prophecies begin to come true and ordinary people are pushed to their limits to survive. Kerri started her last day on earth by missing the red-eye out of Chicago. She should have known then the day had something in store for her. But she was too busy worrying about the biggest client presentation of her career. Yes, they had snagged Google – or at least a chance to convince Google that they should be working together. Kerri still couldn’t believe it – a chance to work with one of the coolest companies on the planet. She could think of nothing else for a week. Kerri was the Regional Creative Director for Submarine, an advertising agency out of Atlanta. Finally, after days of nervous preparation, she was meeting her creative team that evening in San Francisco to go over the pitch. But a new alarm app, one she had downloaded the day before for her smart phone, obviously wasn’t as user-friendly as the website claimed. So she woke up almost an hour late with her heart pumping so fast she thought she was having her first anxiety attack. Join the club she thought. Didn’t everyone in the advertising biz have these things on a regular basis? She better get used to the feeling then because she was definitely in this for the long haul. She rushed around the Holiday Inn suite with her head feeling like David Grohl’s snare drum – and a sick feeling growing in her stomach. If the security line at the airport wasn’t as jammed with vacation travelers as usual – if the traffic to the airport would just for once actually move at the speed limit – or if her taxi driver was a former Formula One racecar driver, then she just might have a chance. But the first cab she got into, just outside the hotel lobby, lost its muffler half way to O’Hare and she had to wait thirty minutes at the side of the highway for a replacement. If she didn’t know better, she’d think somebody didn’t want her to get to California. At the airport she found a flight that would get her to her meeting about three hours late. Three hours was forever, but what choice did she really have? She’d convince her presentation team to forego sleep if she had to, and make the pitch to Google in the morning. That’s why God made caffeine. It would all work out. Kerri finally boarded a shiny new BlueSky Airbus A320 at nine-thirty AM, Flight 2777. As soon as they took off she pulled out her laptop so she could go over her media plan for the new client. There were eighty-seven passengers on board – a fairly light mid-week milk run, so she had room to stretch out. What Kerri didn’t know was this was the jet’s maiden flight; a totally re-designed new Airbus, that for safety reasons, featured three completely autonomous flight processors on board. That was serious redundancy. General Logic, an aeronautics supplier in Reno, Nevada, manufactured the computers. The Quality Assurance manager for that company, Jake Pinkerton, was the person responsible for final inspection of all the flight control modules at the factory. Jake had a bit of a problem though. He liked to drive to Vegas on weekends and live like a high roller. He was seriously addicted to high stakes Blackjack. As a result, the home he and his wife built twelve years earlier and worth about 1.5 million dollars was seriously upside down. In bankers talk that meant he now owed more on the house than it was worth. A fact he had been able to keep from his family. So far. One Saturday evening, about three years ago, sitting at a Blackjack table at the Mirage, a well-dressed man came up to him and asked to talk to him privately. Jake broke into a sweat thinking this was the security manager at the hotel looking for an overdue gambling payment, but he wasn’t. He had a simple proposition. In trade for two million dollars of untraceable cash, this stranger wanted Jake to agree to insert military-designed integrated circuits into the company’s flight modules for the next production run, about fifty units. The stranger smiled and flashed ID. He explained carefully that he was with Homeland Security. These updated chips would allow the feds to track the planes and their data. And yes, it was highly confidential and he knew that company management would never agree to the plan. But they had verifiable data that someone at BlueSky was involved with a terrorist organization or cell. Hundreds of lives were potentially at stake. Jake’s thinking had slowly shifted. He thought of himself as a patriot and was now more focused on the two million dollars than any moral jeopardy he might be facing. The agent gave him his card. It looked and felt official. Gold leaf embossed. “Call my supervisor right now.’ He then gave Jake his name and employee number. Jake peeled out his smart phone and called the number. He had a pleasant conversation with a very officious woman he had been passed onto from what genuinely sounded like Homeland Securities reception in Washington. She knew quite a bit about Jake and his family; things he was shocked to hear over the phone. Only the government could have access to that kind of personal date. That made sense. So Jake agreed. He took possession of a suitcase full of money a few hours later. What choice did he really have? At 12:03 PM, just as the mid-sized jet was preparing for a landing at San Fran Airport, and Kerri was finishing her second coffee, a signal went out to the jets three identical control modules to initiate a complete system reset. Within a matter of mere seconds, all lights went out on the BlueSky jet, the engines stalled and the flight crew exchanged nervous glances. This had never happened to them before. When a big jet losses power, it tends to drop its nose and lose altitude very quickly. Which is exactly what happened. There was no warning for anyone on board, and the eerie quiet of an Airbus settling into an uncontrolled descent is one of the most frightening experiences a passenger can face. The flight crew quickly groped their way to their seats and belted in. When the power first went off, Kerri leaned her head back and sighed. Here we go again, she thought. She was almost surprised her laptop hadn’t burst into flames today. Nothing seemed to be working out. Then she realized that the flight crew was unusually quiet. And there was no word from the pilot. She began to hear people praying around her and a man across the aisle had his cell phone out waiting for it to power up, tears running down his face. For the first time that day, she stopped thinking about the Google presentation. In the cabin, the flight crew was busy trying to radio in an emergency on a communications system that was completely dead. The computers refused to reset. And without any flight management, a controlled glide was also out of the question. Only eighty seconds later, flight 2777 arrowed down into the San Francisco Bay, only a mile from Google’s head office, killing everyone on board. There were over a hundred passenger jets in the air that day carrying modified flight control modules. All could have experienced complete shutdown and subsequent total loss of life. But that would come later. Flight 2777, as it turned out, was only a warm-up. Join my READER’S CLUB and receive a FREE thriller novel – as well as exclusive access to the next CRISPY CRITTERS installment.